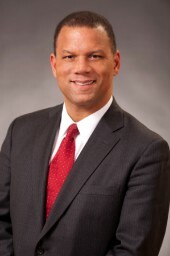 Kyle Farmbry, J.D., Ph.D. - is Dean of the Graduate School and a Professor in the School of Public Affairs and Administration (SPAA) at Rutgers University-Newark. Prior to joining the faculty of Rutgers, Farmbry taught at The University of Texas at San Antonio in San Antonio, Texas, San Diego State University in San Diego, California and Grand Valley State University in Grand Rapids, Michigan. He has also served as a visiting lecturer at the University of Gdansk in Gdansk, Poland, and Benxi University in Benxi, China. In 2017-2018, Dr. Farmbry served as an American Council on Education (ACE) Fellow. In this role he worked with the Vice-Chancellor (President) of the University of Pretoria in South Africa and examined university-based innovation and the implementation of the University of Pretoria - Mamelodi Campus’ anchor institution strategy. In 2016 he served as as a Fulbright Fellow examining European Union immigration policies -- with an emphasis on the challenges and management of the North African refugee movement and integration in the nation of Malta. In February of 2009, Dr. Farmbry was selected as one of thirty-five people from around the world to serve as a Fulbright New Century Scholar. In this role, he was engaged in research examining factors of youth entrepreneurial and civic engagement in South Africa. In May of 2016 Dr. Farmbry launched the United States-South African Higher Education Network (https://www.ussahighereducationnetwork.org/), an effort aimed at building enhanced collaboration between higher education institutions in South Africa and the United States. In November of 2017, he served as one of the founding members of the University Alliance for Refugees and at Risk Migrants (https://www.uarrm.org/), an effort which aims to engage universities and their communities in local and international advocacy efforts on behalf of refugees and at-risk migrants. In February of 2009, Dr. Farmbry’s book Administration and the Other: Explorations of Diversity and Marginalization in the Political Administrative State was published by Rowman and Littlefield. In August 2012, his book Crisis, Disaster, and Risk: Institutional Response and Emergence was published by M.E. Sharpe. His book The War on Poverty: A Retrospective was published by Rowman and Littlefield in July 2014. He is currently completing a book examining issues of migration and xenophobia in the United States, Europe, and Southern Africa. Dr. Farmbry received his BA, MPA, and Ph.D. degrees from The George Washington University. He completed his J.D. degree at the Rutgers University School of Law. This presention will share some observations on the roles of universities in facilitating and encouraging enterprise development in the United States and South Africa.